Dr Buck has taught courses on emissions testing, water testing, occupational hygiene testing and environmental practice over many years. Courses have been devised for the oil & chemicals industry, and for environmental health officers, and special courses can be arranged for most applications. 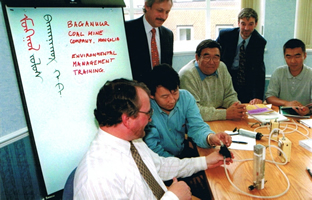 This picture shows a training course & occuptional Hygene Test for a visiting delegation of Mongolian mining engineers.